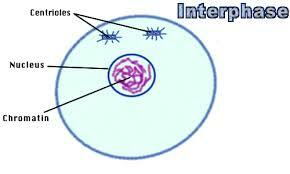 This unit we have learned about mitosis and meiosis, as well as sexual and asexual reproduction. The basic fundamental of this topic is that cells produce cells, and the steps on how cells multiply. First I will talk about the cell cycle, and mitosis. In the Cell Cycle there are three different stages, Interphase, Mitosis and Cytokenisis. In mitosis, there are four stages; prophase, metaphase, anaphase and telophase. In Interphase, the chromosomes duplicate themselves to create strands of identical sister chromatids. Protein synthesis also occurs. It is the time where the cell grows and develops while preparing for mitsosis. In prophase, the nucleus membrane and the nucleus disapear and the chromatin forms into chromosomes, as well as the spindle fibers form. In metaphase, the chromosomes align along the equator of the cell. The spindle fibers also gather at opposite poles of the cell. In anaphase, the spindle fibres pull apart the sister chromatids to opposite poles of the cell. This is preperation for the splitting of the cells. 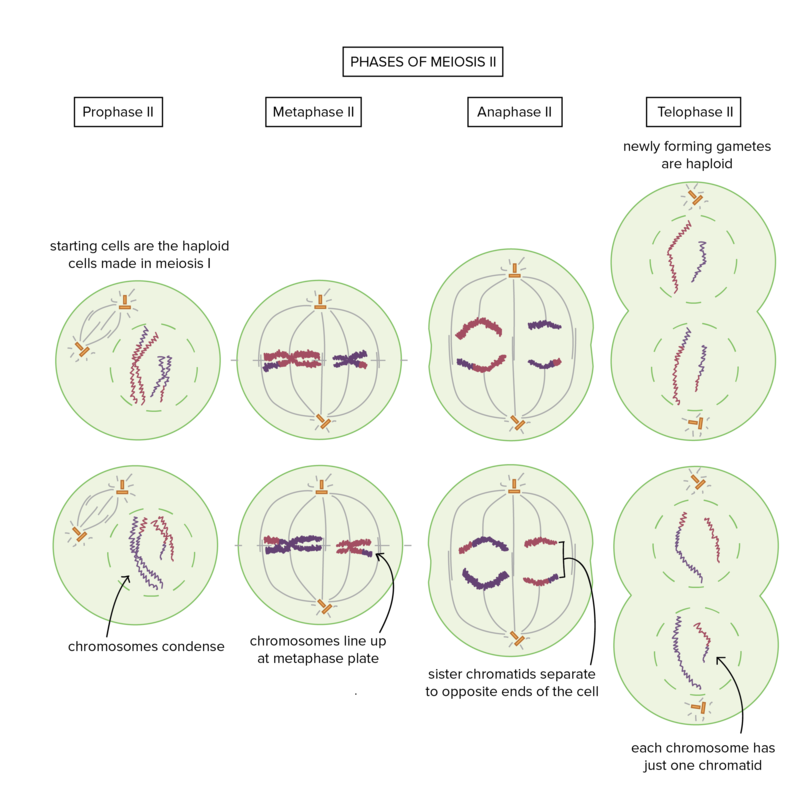 In the last stage of Mitosis, telophase, the spindle fibres disappear and two new nucleus form around two seperate groups of daughter chromosomes. During Cytokenisis, the final stage of the cell cycle, the cell splits into two daughter cells. Next I will talk about miosis. Miosis is divided into two parts; Miosis I and Miosis II. I will go through all the steps of both Miosis I and Miosis II, and then I will compare it to Mitosis. In Prophase I, the chromosomes from either parent pair up and share DNA with eachother. 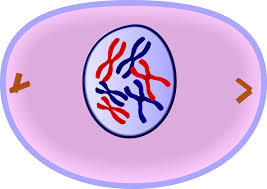 This creates chromosomes with genes from both the genetic mother and father. In Metaphase I, pairs of chromosomes line up along the equator of the cell. The spindle fibers also attach themselves to the centromeres of the chromosomes. In Anaphase I, the spindle fibers pull the chromosomes towards opposite poles of the cell, but the sister chromatids still stay together. In Telophase I, The pairs of chromosomes reach the opposite poles of the cell, and a nucleus starts to reform on either end of the cell. The cells split apart during cytokenisis to create two daughter cells. In Prophase II, the nucleus membranes disappear and the spindle fibers form. In Metaphase II, the chromosomes line up along the metaphase plate, and the spindle fibers attach themselves to the centromeres of the chromosomes. 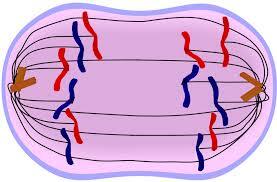 In Anaphase II, the sister chromatids seperate and are pulled to the opposite poles of the cell. 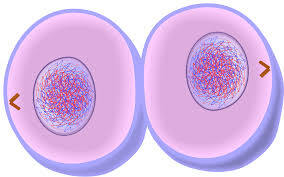 In Telophase II, the nucleus reforms and the cells start to split apart. During Cytokenisis, the two cell split apart to create 4 haploid cells. Each chromosome has only one chromatid. The outcome of meiosis are either sperm cells or egg cells. Bellow is a picture of the stages of meiosis. The major difference between Miosis and Mitosis is that Miosis is a part of sexual reproduction, and Mitosis is a part of asexual reproduction. Mitosis has one part of seperation to create one daughter cell, where as in Miosis it has two seperation parts and the final product will be four daughter cells. 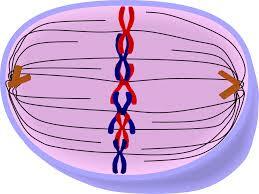 In miosis, the cells are genetically different, but in mitosis they are identical copies of the original cell. They are similar because they both go through the same steps in the same order, just Miosis does all the steps twice. Also, the end results are a daughter cell from a parent cell. Both processes also involve Cytokenisis. Next I will be talking about Sexual and Asexual reproduction. Asexual reproduction is a genetic clone of its parent. Many organisms are created by asexual reproduction. There are five types of asexual reproduction. I will list them bellow and expain them, as well as give examples. First we have Binary Fission. That is when a single cell splits into an identical copie. An example of this would be bacteria. Next we have budding. This is multicellular organisms repeating mitosis to form identical organisms. Buds can detach to form a seperate organism as well. 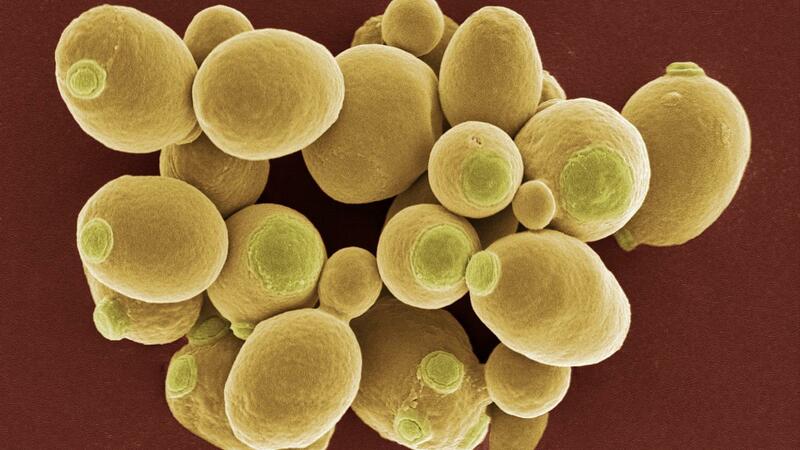 An example of this would be yeast. Next we have fragmentation. Fragmentation is when part of an organism breaks off, and then re grows into a clone of the parent. An example of this would be a starfish. Now we have vegetative reproduction. That is when cells in plants that develop into structures that create new plants that are identical to the parent. 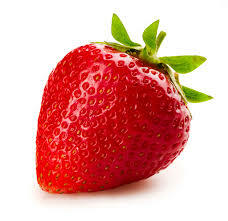 An example of this would be strawberries. Lastly we have spore formation. That is when bacteria, micro organisms and fungi can form spores, and it is a single cell that can grow into a whole new organism. 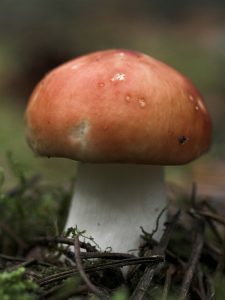 An example of this is a mushroom. 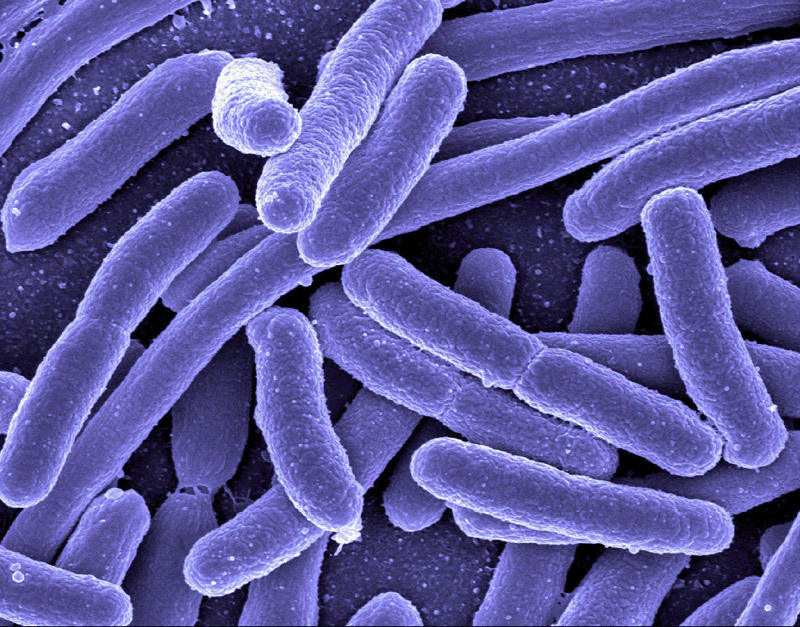 Large colonies can form that can out-compete other organisms for nutrients and water. You require no energy to find a mate. 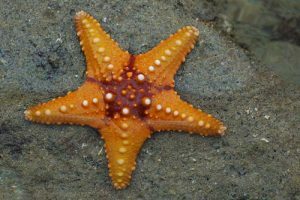 Large numbers of organisms mean that species can survive when conditions and the amount of predators change. Bad conditions could wipe out the entire colony, or even extinction. Some methods prodce offspring that are to close together and so they compete for food and space. The offspring are genetic clones, so a negative mutation canmake the organisms susceptible ot disease and can destroy large numbers of offspring. Now I will talk about sexual reproduction. Sexual reproduction is divided into different stages as well. First is mating, then either external or internal fertilization, then embryonic development and fetal development. Another thing I will write about is pollination. To start off, is mating. Mating is when gametes are in the same place at the same time. Most animals have a mating season sometime in the year to make sure that the environment is favourable for their offspring. Next we have the methods of fertilization. When the egg becomes fertile, cell division will only occur if conditions are met. The temperature will be warm enough so that proteins and enzymes can work properly while the embryo is developing. There has to be enough moisture so the embryo doesn’t dry out. 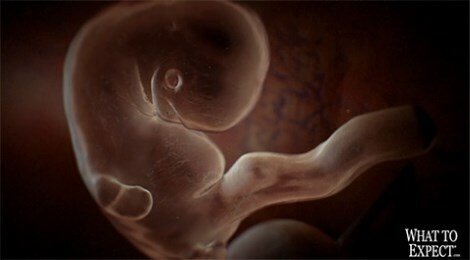 The embryo has to be protected form predators and other possible dangers. In external fertilization, the sperm cell and the egg cell unite outside of the parent’s body. External fertilization is usually found with animals that live in the water. The ales and females release there gametes into the water in a process called spawning. Lots of times egg cells do not survive ocean storms and predators. 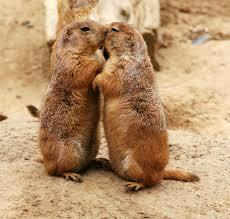 Very little energy is needed to find a mate. Large amounts of offspring are produced at the same time. A population may survive a disaster because they can reproduce many offspring. They do not need to compete with their parents for food. Genetic variation will still be maintained. Many won’t survive outside the parent’s bodies, or become fertilized. They eggs are not protected and are usually prayed upon. Very little survive to adulthood. Next is internal fertilization. Internal fertilization is when the sperm cells go inside the female’s body and meet an egg cell. Once the single sperm has attached itself to the egg, the egg membrane creates a different electrical charge. During internal fertilization, the embryo is nourished inside the mother’s body. The embryo is protected from predators. It requires more energy to find a mate. It also results in fewer zygnotes compared to external fertilization. Next is embryonic development. That is the early development of an organism. In humans, it takes place in the first two months after fertilization. After fertilization, the fertilized egg begins mitosis and a series of rapid cell division. At the end of the first week the zygote divides many times to form a ball of cells. This is called a morula. 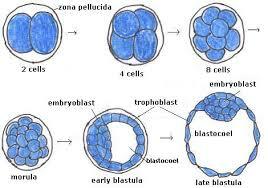 The next part of development occurs at the end of the second week, and a hollow ball of cells form, and this is called blastula.In the next stage, the cells of the blastula organize themselves into three layers. The embryo is now called gastrula. The outside layer of gastrula is called ectoderm. Cells in this layer will form to be skin and the nervous system. The middle layer is called the seoderm and will form into the kidneys, muscles, blood vessels, reproductive organs and bones. The inner layer is called endoderm and will form the lungs, liver and the lining of the digestive system. Now I will talk about fetal development. 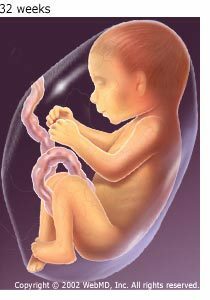 Fetal development is divided into three trimesters. Each trimester is about three months long and major development happens during this time. 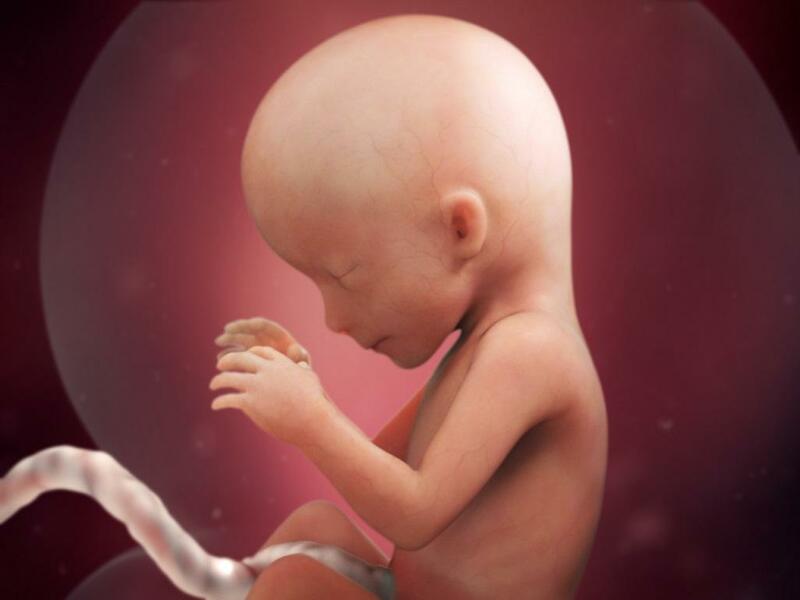 First trimester – the developing organ systems. During this time, the organ systems beging to form. At fourweeks, the brain and spinal cord start ot develop, and at eight weeks the bone cells are form. At this point the embryo is called a fetus. 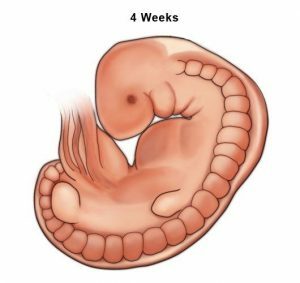 By twelve weeks, the organ systems have formed, and on average at the end of this trimester the fetus is 28g in 9cm long. 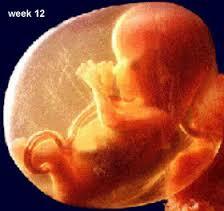 The fetus grow quickly from the age of 12 and 16 weeks. The growth starts to slow etween 20 and 24 weeks. By 2o weeks, the mother can also feel the fetus moving. By the end of the second trimester, the fetus weighs about 650g and is 35cm. Third Trimester – continued growth. In the third trimester the fetus keeps growing, and is preparing for birth. This means that the brain grows a significant amount. At eight months, fat is deposited under the skin to help keep the baby warm after it is born. At the end of the third trimester the fetus is about 33oog and 40-50cm. Offspring are genetically different from their parents, so they have a better chance at surviving new diseases or other threats that can appear in a population. The difference between asexual and sexual reproduction is that in sexual reproduction, their are genes from two parents. In asexual reproduction the offspring are identical to only one parent. During sexual reproduction two haploid gametes join during fertilization and meiosis occurs, and during asexual reproduction, mitosis happens. Lastly I will talk about Pollination. In plants, internal fertilization is through pollination. It is the transfer of male gametes in pollen. The female reproductive pare is the pistil, and the male is the stamen. A pollen tube will form that delivers the sperm cells to the egg cells. The seed’s tough outer layer protects the embryo. I hope you learned something about this science unit on reproduction!